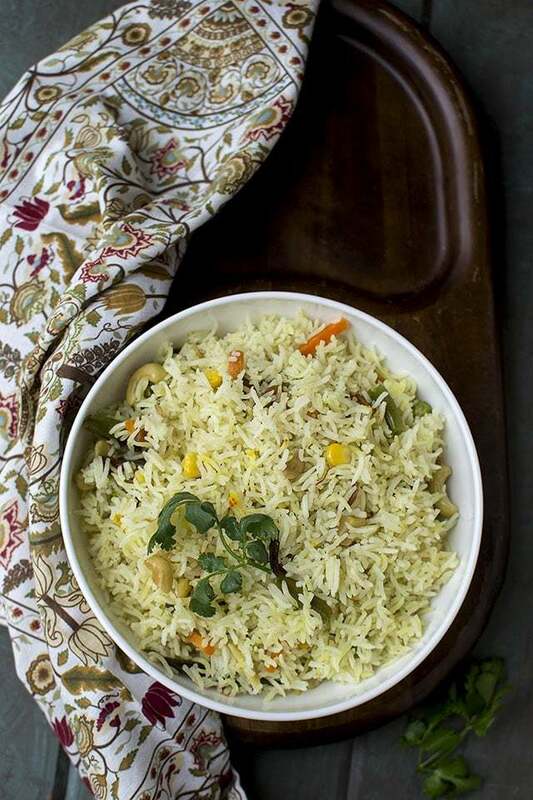 Recipe to make Bengali Mishti Pulao with mixed vegetables. An easy to make rice dish that is aromatic and delicious. Wash the rice until the water runs clear. Drain the water, sprinkle some turmeric on the rice to get a nice yellow hue and spread the rice as a thin layer on kitchen towel or paper towels to dry for about 30 minutes or even more. Rice should feel dry to touch when ready. Heat ghee in a heavy bottomed pan; add lightly crushed cardamom, cloves and cinnamon stick, green chilies and bay leaf. Saute until the spices are aromatic, add cashews, raisina and almonds. Cook till the nuts turn golden. Add the mixed vegetables and cook for 2~3 minutes. Add the rice, salt, sugar and grated ginger. Cook on medium flame for a few minutes until the rice is coated with the ghee and starts to glisten, about 3~4 minutes. Add 11/2cups of boiling water to the rice along with the saffron strands. Cook uncovered till the water on the top of the rice almost disappears. Now lower the heat, cover the pot and simmer for 5~6 more minutes. Turn off the heat and let the rice sit for another 10~15 minutes. Uncover the pot and fluff the rice with a fork. Serve with spicy side dish or just as is.